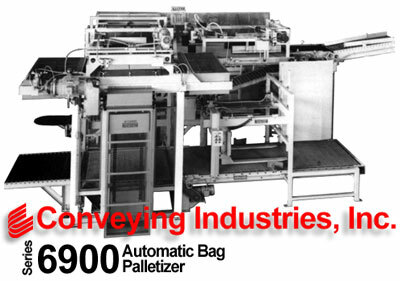 The Model 6900 Automatic Palletizer will palletize up to 35 bags per minute. Rate varies, depending on the application and bag pattern. Bags enter the Palletizer through a flow divider. The flow divider is programmed to work in conjunction with bag turners to proved the required pattern. When each layer of bags reaches the forming area, it is pushed on the split loading plate for delivery to the pallet. Empty pallets are automatically placed on a powered wire mesh conveyor. One pallet at a time is conveyed to the pallet elevator. The elevator raises the pallet to the loading position below the split loading plate. After each pallet is loaded with bags, it is lowered and conveyed to the accumulator conveyor for fork truck pick-up. All functions are automatically sequenced to ensure a constant flow of bags and pallets. Models 6950 and 6960 Automatic Palletizers are available for slower bag rates and "butts out" pattern. The Model 6900 Automatic Palletizer is specifically designed to handle a variety of bag sizes, bag rates, bag patterns and pallet types and sizes. The simple design and 22,000 lb. heavy duty tubing and channel construction reduces vibration to ensure years of high productivity. The split loading plate transfers the center of the bag layer to the pallet first to ensure a uniform pallet load. Four layer squaring plates at the pallet loading area ensure that a tight bag layer is transferred to the pallet. After each layer is transferred to the pallet, the entire pallet load is raised and compressed on the underside of the loading plate to ensure a level top for double and triple stacking in the warehouse. The pallet elevator is counter weighted and powered by one motor and helical shaft mounted reducer with air brake. The empty and filled pallets are transported on extra heavy duty flat wire mesh conveyors to ensure proper handling of pallets of any quality. Air cylinders and electric motors provide the power required for the Automatic Palletizer. Hydraulics are not used to ensure a clean operation and lower maintenance cost. All functions are controlled by a programmable controller. The Pallet Dispenser is an integral part of the Automatic Palletizer and is operated by an air cylinder and motor to eliminate high maintenance items, such as gears and special linkages. 13 empty pallets can be stacked in the pallet dispenser from the end or side. When dispensing a pallet, two fork truck tines are inserted in the next-to-the-bottom pallet. The stack is then raised, leaving the bottom pallet on the conveyor. Each Automatic Palletizer is custom designed to meet specific requirements. Conveying Industries can meet your total system requirements with a complete line of material handling equipment, including Conveyors and fully Automatic Palletizers.